Pupils' fingerprints will be used to register and measure attendance at a primary school in Wiltshire. The school, which prefers not to be identified until parents have been consulted, will use technology already piloted in Singapore. The head teacher said it would aid self-registration and cut teachers' administrative workloads. 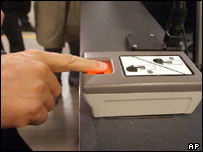 Youngsters will use check-in stations each morning, where the technology will identify and verify who they are. The parents of any absentees will be notified using text messages on their mobile phones. The head teacher said: "We will be rolling it out for year five and six. "It is not to do with truancy - we have a statutory obligation to cut teachers' administrative tasks." The human rights group Liberty, said the scheme was not a major infringement of human rights. "But you always need safeguards, particularly around the fingerprint records," a spokesman added. Jeremy Whittaker, project manager for the scheme, said: "The data will just be used for registration. Like all records, it will be protected under the Data Protection Act. "The other vital information kept by the school on students - date of birth, address and so on - is potentially more dangerous." The technology has yet to be installed at the school, but the trial will last until December. The system has been used by the US Government, banks and in diamond exchange offices, as well as in anti-carjacking devices.